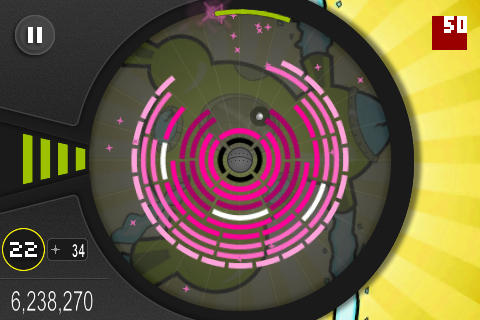 Radial 50 is a brick breaker game that changes it up by turning it into a circular perspective. The bricks are composed in multiple rings shrinking towards the center. Rather than having to destroy all of the bricks, you just need to reach the center diamond. In some levels the diamond will be locked, and you have to hit a certain number of bricks to unlock it. If you miss the ball and it hits the side you will lose one health bar. In each level you have five health bars to use that replenish as you play, but if you lose all health its game over. Each brick you break releases particles that you can collect with your paddle. The paddle spins 360 degrees around the outer circle. 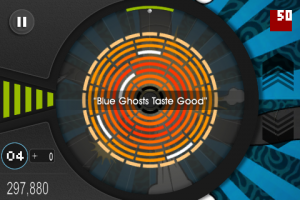 As the name would suggest, there are 50 levels of increasing difficulty composed in batches of five. This means that levels one to five are the same style as six through ten, but the latter are more difficult. 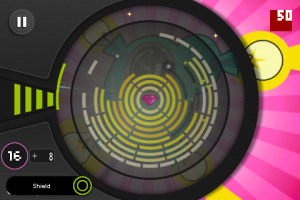 Also every five levels have a unique background and audio theme. Every level has a unique name that is a shout out to another video game. To control your paddle, there is a dial on the right of the screen, and you move your thumb up and down. As the ball approaches your paddle there is a line indicating the direction it will bounce off. With the 1.02 update there is now a halo around your ball to make it easier to see. Also there are 20 total power-ups/power-downs, with ten of each. Since it’s an arcade game, scoring is a major aspect of the game. Your score is dependent upon how many bricks you hit, the number of particles you collect, the time to finish the level, and bonus events depending on time, particles collected, and health. 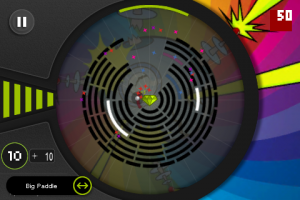 Radial 50 includes deluxe online high scores and achievements. 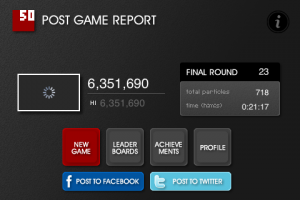 The high scores are intricate enough to show your ranking in your city, state, region, country, and the entire world. There are 20 achievements to unlock from finishing a certain number of levels, to reaching a certain score or number of particles. You can also tweet your score, and post it to facebook. The visuals are amazing and so is the overall polish. Every level is beautifully designed with a unique background image, and varying color blocks. The animations are superb with particles bursting out, and flashing when they reach your paddle. If the ball hits the side the play area flashes red, and your iPhone vibrates. When you finally reach the center diamond there is an explosion of particles from all the remaining bricks. The sounds are great as well with ten different techno beats, one for each group of five levels. There is a chime with every brick hit, and particle caught, and a thud as the ball bounces off the paddle. The revolutionary twist on brick breaker may be the best aspect of the game. The gameplay is outstanding and one of a kind exclusively on the iPhone. Playing to reach the center rather than having to clear all of the blocks provides much more fun. The spin dial to move the paddle works well, allowing you to focus on getting in the right spot to not only hit the ball, but collect the particles too. The game is also very challenging, and one of the most difficult in the App Store. There is an entire circle you need to cover, so there’s a lot more room to miss the ball. Also most levels have an unlocking mechanism to get to the center crystal. Once unlocked, rings emit outward from the center requiring more bricks to hit. Replaybaility is high with this title simply with fifty levels to get through. 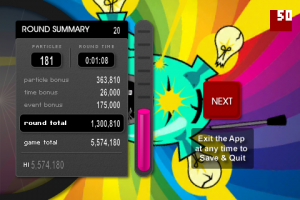 Then there are the deluxe online high scores allowing you to compete locally and even around the world. Also included are 20 achievements ranging from the simple to the absurd like being able to hit the entire outer ring without hitting any inner brick. Finally there is an outstanding save system that picks up at the exact point you left. The only potential problem is that this game may be too difficult, and some people will be frustrated rather than enjoying it. It’s difficult at first to get a hang of it, but if you give it time you'll figure it out. It is annoying when you make it to level 25, then get a curve ball power-down, and lose, making you start over at one. I think there should be an option to continue, resetting your score, to give players the chance to play all 50 levels. It may get repetitive as well with only five unique level styles that you will pick-up relatively quickly, and be bored by. I would love to see an alternate control method where you use your finger on top of the paddle, and spin it 360 degrees.